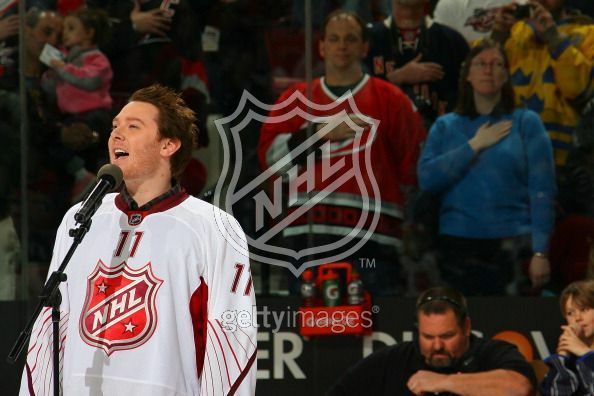 On Thursday, January 24th, Clay Aiken attended the Carolina Hurricanes Ice Hockey Game. 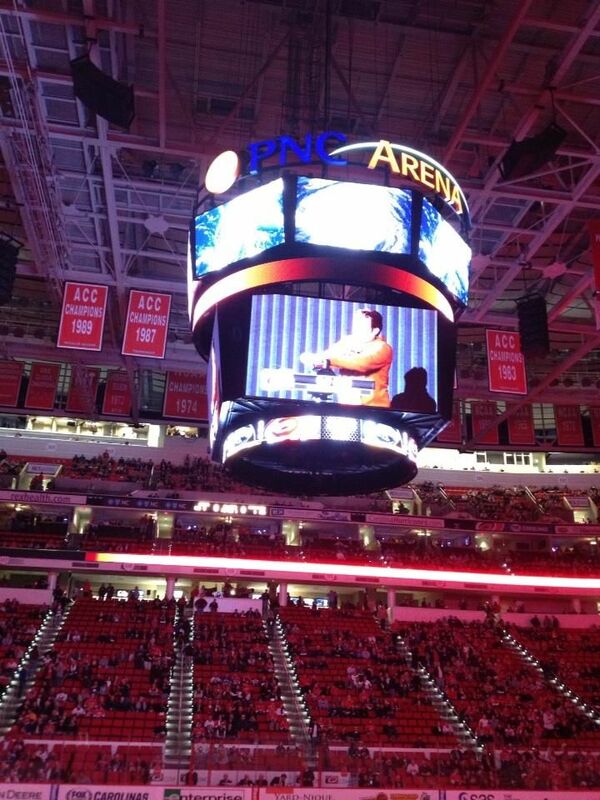 It was a good night at the PNC Arena (former RBC Center) as the Hurricanes out scored the Buffalo Sabres 6 -3. The Carolina Hurricanes Warning Siren debuted on Oct. 10, 2008, at the Hurricanes’ 2008-2009 home opener against the Florida Panthers. 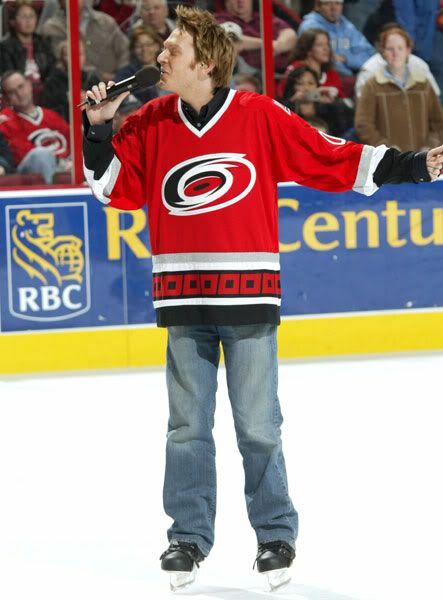 It began a new Canes tradition where, prior to the start of each game, a celebrity, corporate sponsor, season ticket holder, suite client or fan acts as the official “Siren Sounder” of the game and operates the “Hurricanes Warning Siren” to signify that the team is about to take the ice. The Hurricanes Warning Siren is an actual air-raid siren and is located at section 228, directly below the “Home of the Carolina Hurricanes” sign that adorns the upper-bowl façade. Every game has had a different Siren Sounder, each tending to have his or her own special way of pumping up the crowd for the game to begin. The Hurricanes Warning Siren has received local and national attention, especially during the 2009 playoff run. Past siren sounders include Super Bowl champion Bill Cowher, wrestling great Ric Flair, Miracle on Ice member and 1980 Gold Medalist Jim Craig, NFL players including Carolina Panther Steve Smith, former Hurricanes players such as Bates Battaglia, N.C. State coaches Sidney Lowe and Kellie Harper, a variety of Olympians including Cullen Jones, Senator Elizabeth Dole, Ryan Newman and fellow NASCAR drivers and more. I am glad that Clay got to have an extra bit of fun tonight. There certainly were lots of tweets about his appearance at the game. Clay is no stranger to ice skating. We have had a chance to see Clay on the Ice many times. Do you remember these skates? I was there last night and tried to get a picture but I was too far away. For some reason I can't get a signal on my phone up in the 3rd level. I tried to tweet and fb but nothing posted. I think my fb finally posted later, but gee would like to be in real time. Glad someone was able to capture the moment. Love the photos, wish i could have been there but i live too far away. Thanks guys for the photos xox. Musicfan, thanks, you are always quick to post any news of Clay. 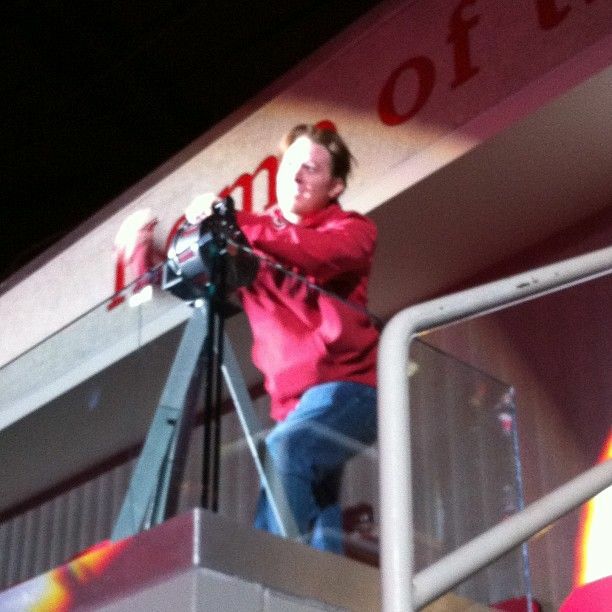 He must have had a good time sounding the siren last night…and watching his team win. 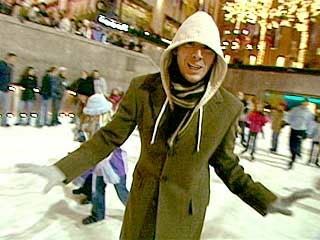 I never saw the photo of Clay on skates at Rockefeller Center in that green coat and hoodie before. I attended the Holiday on Ice show plus the fan pre-dinner. What a wonderful night that was! I'm glad Clay was honored last night by the Hurricanes. I hope Clay had fun at the game. Thanks for letting us know about this. That was very interesting. I didn't know that they have a siren to start the hockey game there. Looked like he was enjoying it. There sure were a lot of tweets about it too. Everyone loves Clay!! Error: Error validating access token: Session has expired on Tuesday, 21-Aug-18 16:13:01 PDT. The current time is Thursday, 18-Apr-19 05:58:01 PDT.